I've had my APC UPC (uninterruptible power supply) for a couple of years now. It's about the third or fourth one I've bought for myself over the years, and I just recently bought another one for my husband. He worked solely on a laptop for a long time and didn't have to worry about power outages, but recently he switched to using an iMac. After the first power outage came along and killed his work, he asked me to order one for him. I've always used the APC brand for my UPS battery backups. I haven't done any research on the various brands, but APC seems to be the largest and best-known, and they've always served me well. 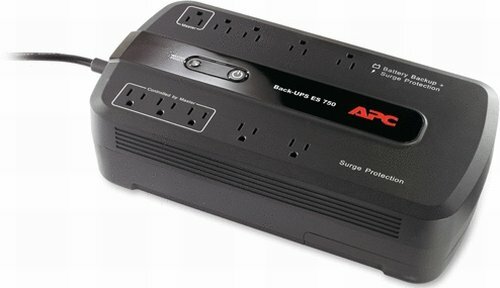 I buy the APC BE750G battery backup model. Using it on my Mac Pro with two 27" monitors, it gives me about 12-15 minutes to save my work and shut down gracefully when the power goes out. It connects to my computer via USB and my Mac's system preferences recognizes when the UPS is connected and allows it to detect a power outage and automatically save my work and shut everything down, in case I'm away from my computer when the power goes out. That's a big fat YES! The shutdown options are configurable to shut down after using the UPS batter for 1 to 15 minutes, when the time left on the battery is from 1 to 15 minutes, and when the battery level is below a certain percentage. The thing comes with some software that APC calls "Power Chute" that works on Windows computers only. They probably get more options than I do in my System Preferences. I hate always being treated like a red-headed stepchild just because I'm a Mac user. The BE750G has 10 power outlets. Five of the outlets are surge protection only, and 5 are surge protection plus battery backup. So there are plenty of outlets for my computer, my monitors, and my external hard drives, printers and other peripherals. It also has plugs for a modem so I can run my modem through it to protect it against power surges as well. There's an energy-saving master outlet and 3 "slave" outlets — if the device plugged into the "master" outlet is shut down, it automatically shuts down everything plugged in the "slave" outlets. Bottom line: When the power goes out, the UPS keeps my computer running long enough for me to save my work and shut down, or if I'm not here, it saves my work and shuts things down automatically. That's good peace of mind for less than $100.